Face recognition has been studied and developed for over decades. However, the long distance face recognition accompanied with automatic alignment is still a challenging topic due to its distorted and quality-degraded environment. This problem is also known as Face Recognition at A Distance (FRAD), which is a common issue in video surveillance applications. A solution to FRAD has been proposed by MCL PhD student, Chun-Ting Huang, visiting scholar from UESTC, Professor Zhengning Wang, and Professor C.-C. Jay Kuo. 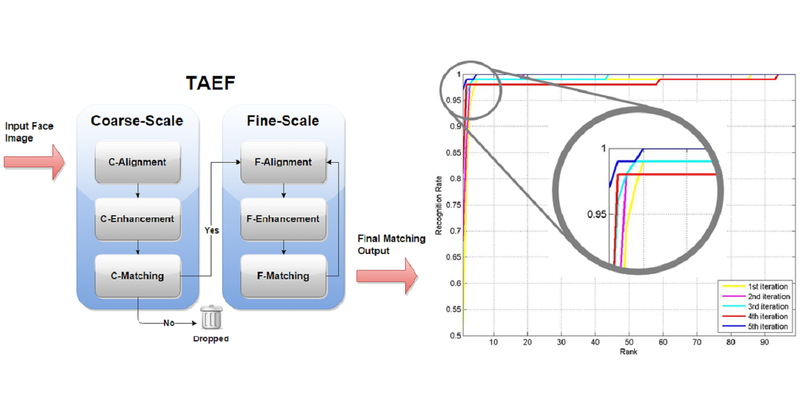 The method called Two-Stage Alignment/Enhancement Filtering (TAEF) system consists of three main components: a cross-distance face alignment technique, a cross-environment face enhancement technique, and a two-stage filtering system. In the first stage, the given probe image is adjusted and examined in coarse-scale for eliminating unlikely candidates, and then the procedure is conducted for every individual probe/gallery image pair for higher accuracy at the second stage. The first rank recognition rates of the TAEF method are 100%, 100% and 97% for 60-, 100- and 150-meter visible-light images in the LDHF database, respectively. This work has been accepted for publication in the Computer Vision and Pattern Recognition (CVPR) 2015 Workshop on Biometrics held in Boston, June 11th, 2015.